Rotarians Sepalika and Asha of RCCR visited Kalmunai in the Ampara District to get a first hand look at the Well Cleaning Process and speak with the project implementors, recipients and relevant authorities. They were able to visit both '500 Well Cleaning' Projects of Stretchline & CandleAid. 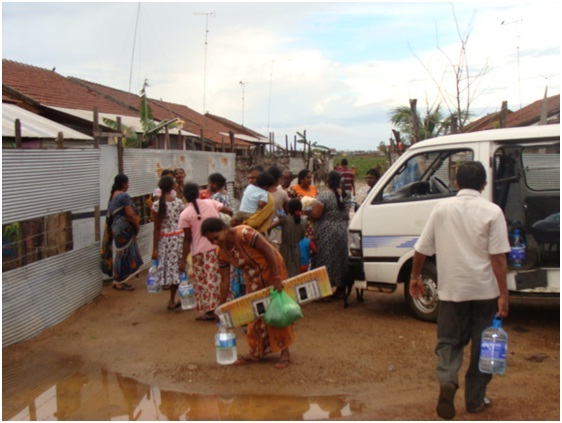 The RCCR Members were bombarded with words of praise and acknowledgement towards the donors and cordinators of the Well cleaning project, which resulted in many of these un-fortunate victims of the dreadful floods being able to continue with their daily livelihoods and chores without the fear of water borne illnesses affecting their loved ones. Rtn. Asha with a Cleaned Well recipient family. Rtn. Sepalika with another Cleaned Well recipient family. 500 Wells of the 1st 500 Wells Cleaning Project sponsored by Stretchline (Private) Limited have been cleaned. out of this, over 250 wells have already been certified by the PHI (Public Health Inspector). Awaiting the balance to be certified. Below are a few pictures of the inauguration day. 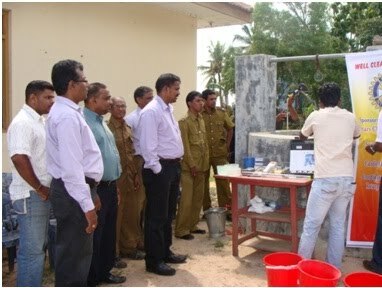 Quality of the well water is tested and report submits to the P.H.I’S for these areas. Vellavely D.S and M.O.H Participated in the Inauguration Ceremony. RCCR is Coordinating a Relief Effort in Japan via the Matsusaka Rotary Club in Japan - RI Dist 2630. 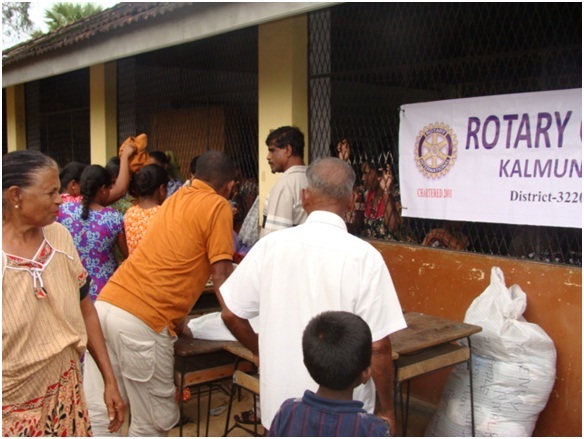 We are currently looking at providing monetary support towards the Rotary Club so that they may purchase the required relief items as needed. If you CAN or would LIKE to help through our Rotary Club, please contact us ASAP. The 1st 100 out of the 500 Wells Sponsored by Stretchline (Private) Limited, for De-Contamination due to the Floods have been successfully completed. We would like to offer our thoughts and prayers to the people and victims of the Tsunami in Japan. 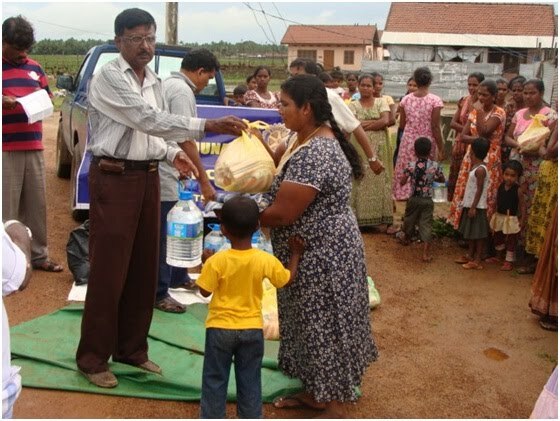 RCCR together with Stretchline (Private) Limited will commence a Project to Clean & Purify 500 Wells in the Kalmunai/ Batticaloa areas that were contaminated due to the recent floods on Monday, 7th March 2011. The 500 Wells will require an estimated 25 days to complete. We are grateful to Stretchline and its staff for the full sponsorship extended towards this Project. Project estimate is LKR. 1.2 Million! We have now reached LKR 3.35 Million in Donations and Pledges thanx to Rotarians and Friends of Rotary. 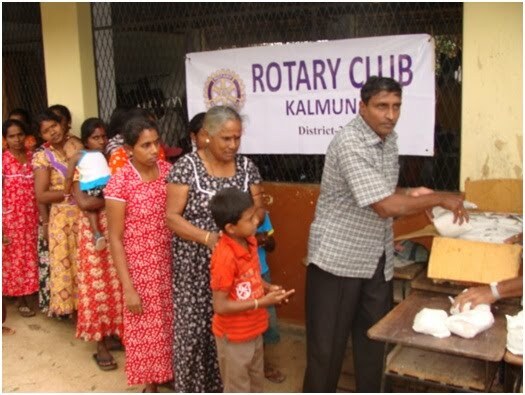 RCCR Flood Relief Effort Committee just authorized and released a further LKR 200,000/- to Rotary club of Kalmunai to purchase emergency relief items. We felt the funds released to RCK would speed up relief efforts as sourcing and transporting from Colombo would delay our efforts by 2 days minimum, which we cannot afford to incur due to the urgency of the requirement! 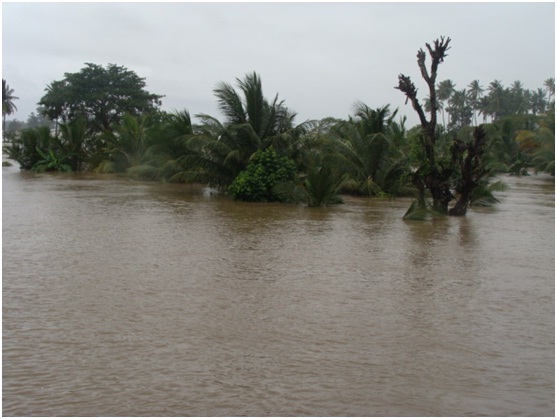 The death toll due to the latest wave of floods has gone up to 16 while an estimated 1.2 million people had been affected and 172,535 people were displaced as of today. Pictures sent in by the Rotary Club of Kalmunai (RCK), who are actively coordinating on-site Relief Efforts in Kalmunai areas show the results of a sudden shower that resulted in the surrounding areas. The submerged Jeep is the RCK vehicle used to distribute the Relief items, which according to RCK needed rescuing. Current round of rains have resulted in many people being left homeless and in-need of urgent assistance. The rains have damaged and destroyed many retaining walls of lakes and damns releasing large volumes of water towards un-suspecting residents. The above Sat image of Sri Lanka clearly shows the permanent cloud formation over the Island. Temperatures range from a high of 31C to a low of 24C with specific areas in country dropping to much lower levels! Storms and Thundershowers are forecasted for the next couple of days! The Rotary Club of Kalmunai distributed Lunch Parcels, Mineral Water Bottles and Used Clothes for the Refugees accommodated in Valathapitty Vidyalayam. These peoples are displaced from Mallikaithivu, and Valathapitty low land areas. Valthapitty is approximately 20Km from Kalmunai Town. RCK members generally pass through Sammanthurai, however, yesterday they we could not travel through Sammanthurai or through Malkampitty route due to floods. 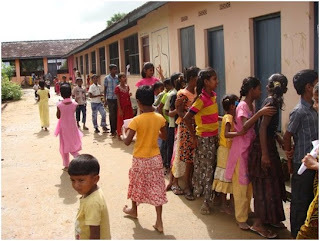 They reached this School through Akkaripathu, which is almost 60 Km from Kalmunai town. 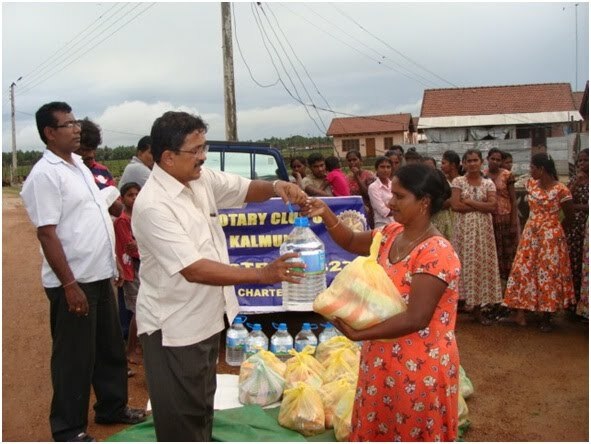 More 350 Members from this Refugees Camp were benefitted by this relief distribution at Valathapitty Refugee Camp. 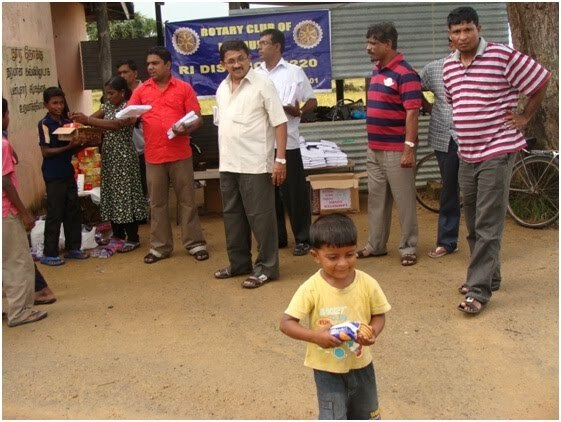 RCCR donated Mineral Water Bottles and Used Clothes towards the distribution at this Refugee Camp. 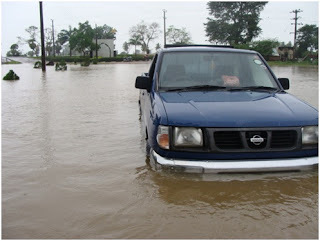 As of Friday, 04 February, 2011 "The flood situation in the country reached dangerous levels with the number of affected families increasing by over 100,000 within hours, bringing the total of affected families to 230,000, causing six deaths, official said. The number affected stood at 100,000 late Thursday evening. Bad weather took its toll in 17 districts while it was reported that those affected were kept in 322 camps. Spill gates were opened in all tanks in the Anurdhapura, Polonnaruwa, Batticaloa, Ampara, Vavuniya and Trincomalee Districts as almost all the tanks reached spill levels. Stretchline (Private) Limited - Sri Lanka, together with their Staff have come forward towards the complete sponsorship of cleaning 500 wells in Batticaloa/ Kalmunai. RCCR would also like to acknowledge the receipt of Clothing and Mineral Water Bottles by their staff towards the flood affected in the East Coast of Sri Lanka. 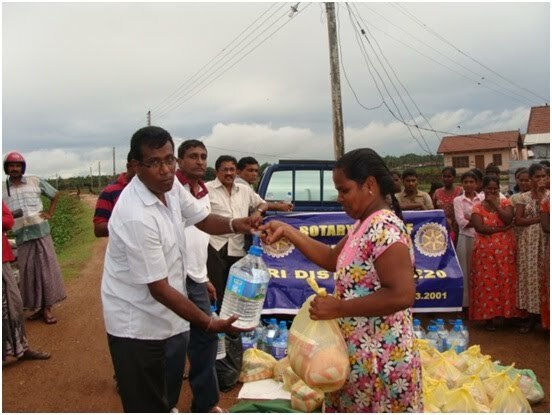 RCCR would like to take this opportunity to acknowledge and thank the Stockholm International Rotary Club (SIRC) for their valued contribution of LKR. 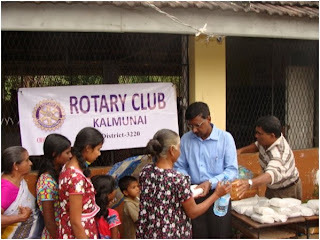 33,380/- towards the flood relief efforts of our Club. 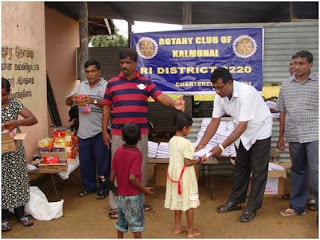 The Rotary Club of Kalmunai distributed Dry rations and Bed Sheets for the Flood affected people from Pandiruppu Tsunami village around 2 Km from Kalmunai town. This is also a small village Constructed for Tsunami affected people who lived 65m from the sea. These houses were constructed in very low-land paddy fields after filling earth to a minimum required level. 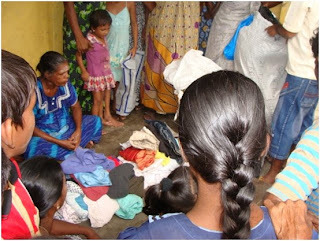 During the flood all the villages were displaced and had to be accommodated in a refugee camp at Pandiruppu. 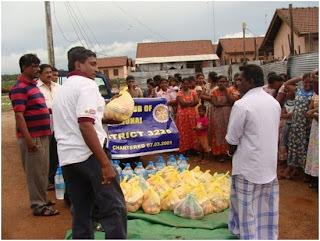 Around 36 families benefitted by this relief distribution at Pandiruppu Tsunami Village. RCCR contributed Bed Sheets towards this effort. 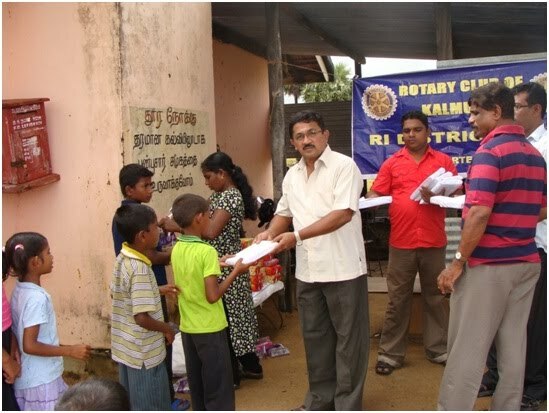 The Rotary Club of Kalmunai (RCK) distributed Exercise books and Biscuits (Contributed by RCCR) to the flood affected students from Aligambe village around 45Km from Kalmunai town. to 1948 this area was completely under forest cover, and these people lived without clothing/ dresses. Rev. Fr. Kook (an American) entered this area and helped improve this forest into a small village. The villages even to this date use a deferent language/ dialect apart from Tamil. urrently, a small Church and a School up to grade Eight for around 300 students can be seen. owever, there is still no electricity since not many people are aware of their plight or for that matter, their existence. RCCR together with RCK would like to request a willing donor/s to assist us towards providing these villages the basic necessities to help to improve their living standards.